This delightful crocheted baby turban makes for a great handmade gift you can bring to your next baby shower. It is a quick and easy crochet project and is suitable for confident beginners. This crochet pattern starts with the magic ring. Not familiar with the magic ring? You can find a great video tutorial here: Crocheted Magic Ring [A How To Tutorial]. The designer responsible for this super cute turban for a baby is Carrie over at This Mama Makes Stuff. 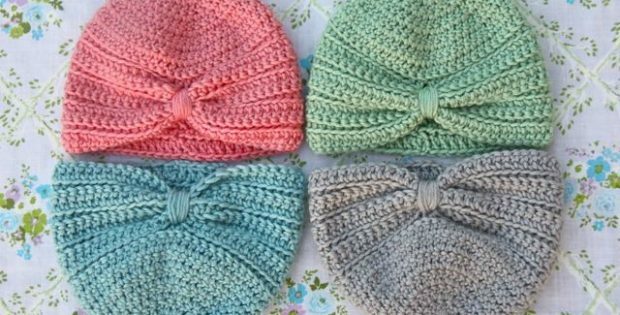 She has written a great crochet pattern with instructions for how to crochet this adorable turban for a baby that is 0 to 3 months. You can access the FREE crochet pattern for this gorgeous baby turban from Carrie’s website. To access the FREE pattern for this great crocheted turban for a baby, please click here: Baby Turban Pattern.